Have you heard about the city council's 'Stand up for Peterborough' campaign? Read this article on the Peterborough Telegraph website. It cannot have escaped your attention. Essential services, services that are paid for in part via our council tax, are no longer up to scratch. Our streets are dirty. Housing lists are long. Treasured local services like Orton's bowling club are yet again under threat. What might not be so clear are the reasons why Peterborough City Council is currently experiencing such challenging circumstances. Council tax just went up by 6% so why is there a problem? There isn't one single reason for this present financial crisis. Management of the budget has a role to play, as do the decisions taken by city council. However, it is undeniably the case that Peterborough is suffering due to a dramatic cut in the amount of funding the Treasury makes available to our city council. The problem is a programme of cuts known as 'austerity'. In 2013/14, Peterborough City Council received £55million via a Revenue Support Grant from the Treasury. This grant supports a range of council services. The grant will have reduced to £15million in 2018/19 and then right down to £10million in 2019/20, a reduction of 80% over seven years! It's not fair, not fair at all. 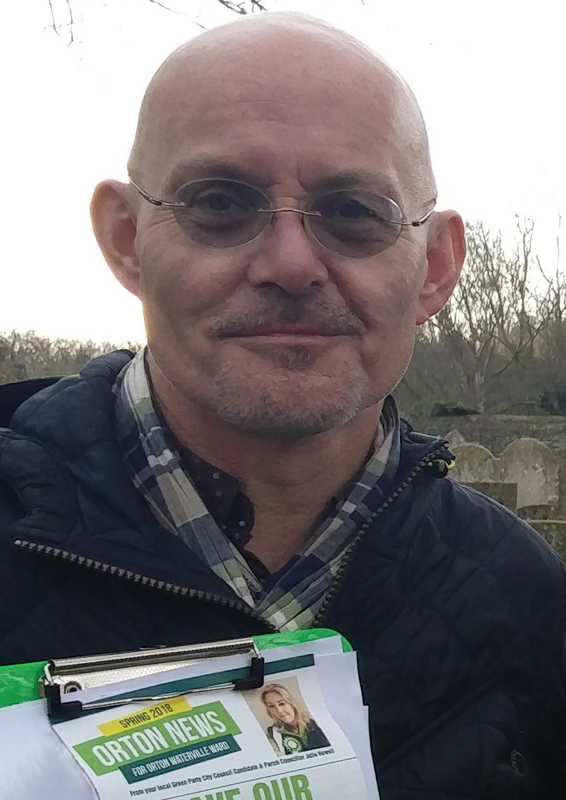 In response, Peterborough City Council Leader Cllr John Holdich launched a public campaign 'Stand up for Peterborough' on 30 November 2017, the aim of which is to garner local public support and to then lobby the Treasury for an increase in funding. If you haven't heard of this campaign you are not alone. I don't think many local residents in Orton have heard about it and from what I've heard support from the public has been slow to catch on. My background is in campaigning for disabled people's rights. I understand why the city councillors feel that the 'Stand up for Peterborough' campaign should be effective. I also understand why it's failing to capture the imagination of residents. The trouble is, for a campaign like this to succeed it needs a massive amount of grassroots support, and this is something that very few local councillors in our city have managed to achieve. Essentially, if you want to attract the attention of residents over a particular issue you have to speak to them, clearly and frequently. You cannot suddenly spring a campaign on them out of the blue and expect them to support it. You have to work hard for residents all the time. When you do, then and only then, can you expect them to get on board. This is really basic stuff. I do care about Peterborough. I care a great deal. So I decided to take matters into my own hands. On Wednesday 28th February, when the snow was falling thick and fast in London, I travelled to Westminister. 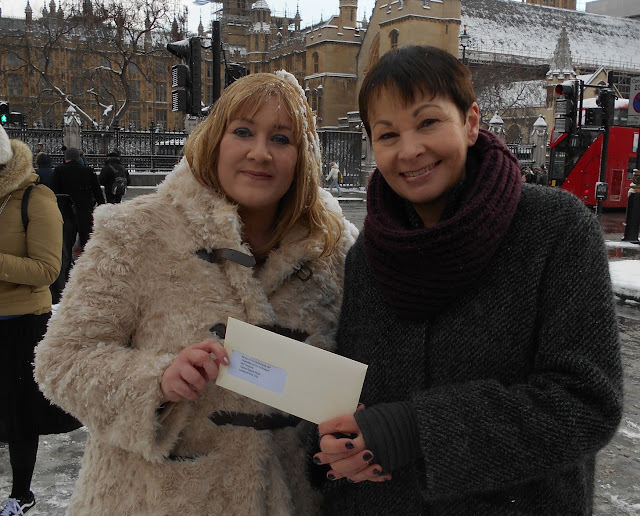 Once there, I met up with Green Party MP Caroline Lucas and together we walked to The Treasury where we handed in a letter for the attention of Phillip Hammond, Chancellor of the Exchequor. 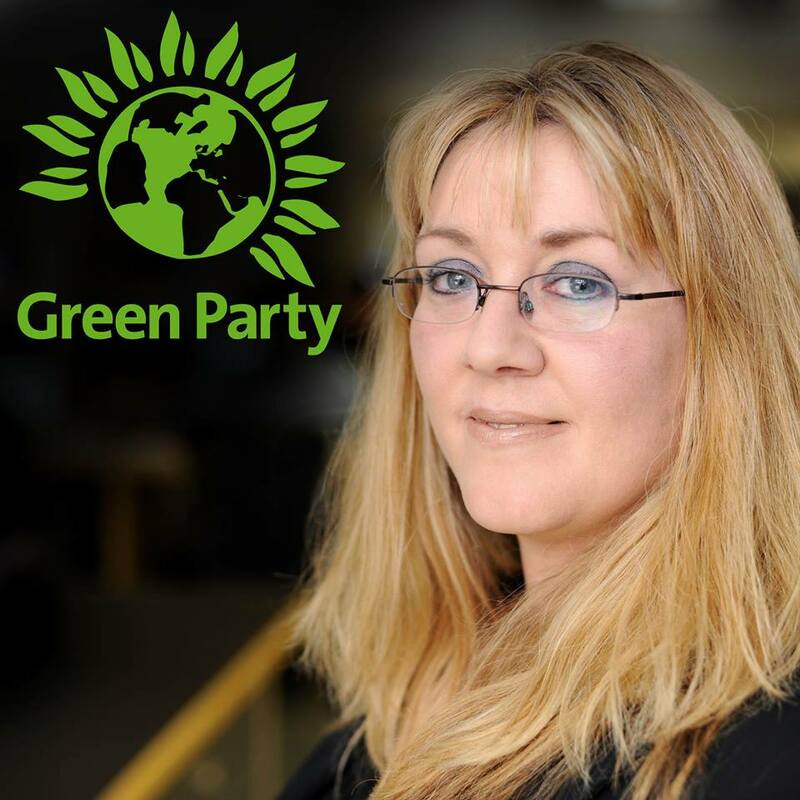 As Green Party councillors and council candidates, we are writing to you, ahead of your Spring Statement on 13 March, to urge you to heed warnings from the Local Government Association (LGA) of real and growing uncertainty about how local services will be funded beyond 2020, and to urgently provide local councils with the money they so clearly need to protect services and restore spending on community and frontline services to sustainable levels. 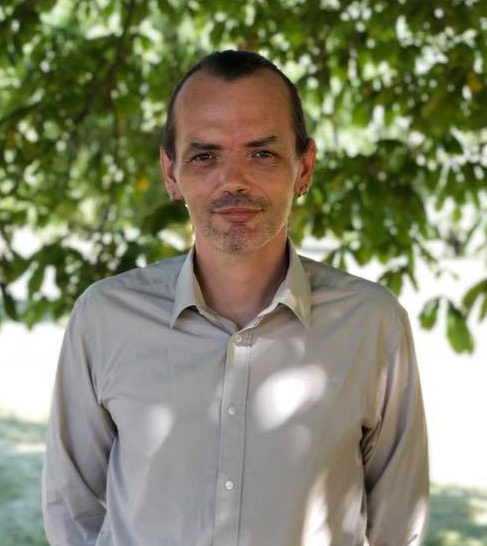 “Local services are facing a £5.8 billion funding gap in 2019/20, as well as a £1.3 billion pressure to stabilise the adult social care provider market today. The additional council tax flexibility – estimated by our analysis to be worth up to £540 million in 2019/20 if all councils use it in both 2018/19 and 2019/20 – is nowhere near enough to meet the funding gap. The Government needs to provide new funding for all councils over the next few years so they can protect vital local services from further cutbacks. Indeed, our local experience confirms that the current funding gap presents an existential challenge not only to valued community services, but to essential frontline services such as support for users of adult social care, older people, looked-after children, care leavers, those with disabilities or special educational needs, survivors of domestic violence, and low-income families in crisis. And it is having a deeply negative impact on initiatives needed to improve equality, sustainability and resilience, such as providing genuinely affordable, energy efficient homes, supporting socially necessary bus services, transforming how we collect and sort waste, and public-backed investment in renewable energy. This cannot go on. We believe the Government must act now to end this unprecedented and ultimately counter-productive erosion of local government. Strong communities require strong local services to support the most vulnerable and those in temporary crisis. It is vital that essential local services are both protected from further cuts and restored to sustainable levels. I am not opposed to Peterborough City Council's 'Stand Up For Peterborough' campaign. However, some of us have always stood up for Peterborough and feel disappointed that the situation has been allowed to get as bad as it has before our city councillors made any effort to inform the rest of us of our city's plight. I also doubt very much that many of our city councillors really support the campaign. When you visit the campaign website you are offered an opportunity to download a campaign 'frame' to add to your Facebook profile image. To date, I haven't found a single city councillor using it. If they have so little faith in the campaign, why should we lend our support to it? The MP for Orton (and the rest of the NW Cambs constituency) is Shailesh Vara (rarely seen here but he is pretty responsive on email in my experience). He made a video supporting the 'Stand Up For Peterborough' campaign. When I looked at it just now it only had 28 views, and it's been on YouTube since 27 November 2017. That's not very impressive really, is it? My experience of Orton residents is that they are smart, switched on and perfectly able to stand up for themselves. But we can only do this effectively as a community when we know what's going on. Find out more about Peterborough City Council's 'Stand up for Peterborough' campaign.